It’s about time I posted a savory recipe on this blog! 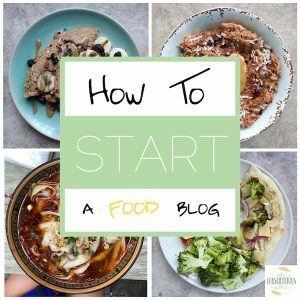 When I looked at my blog’s home page recently, I started to worry that people will think all we ever eat are cookies, quick breads, energy bites and chocolate coated desserts. While we love those things and almost always have a couple different treats on hand, we do eat our whole grains and veggies too. I’ve just been obsessed with baking lately so those are naturally the recipes that will pop up on this space. Additionally, our lunches and dinners are often so simple (whole grain + beans + veggies + sauce) that they don’t require a recipe. 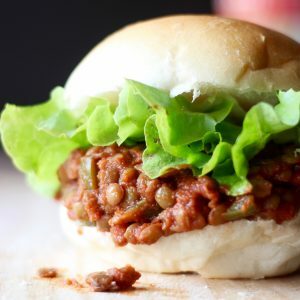 Lately, however, I’ve been whipping up some more special, savory meals and today I’m sharing one of them with you: Lentil Sloppy Joes! Did you grow up eating sloppy joes? I did and loved them! While we were in Ireland this past winter, my mom made a batch one night and the sweet, ketchup-y smell brought me straight back to my childhood. 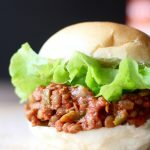 Sloppy joes are always so hearty and comforting and I’ve been meaning to create a lentil-based version for a while. 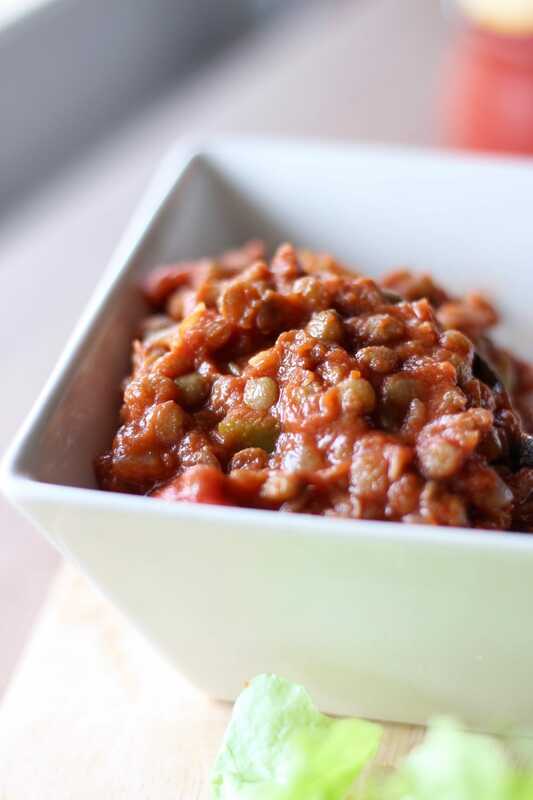 This recipe couldn’t be easier to make, especially if your grocery store has canned lentils. Otherwise, cooking dried lentils from scratch is super easy and requires a fraction of the time you need to cook dried beans. 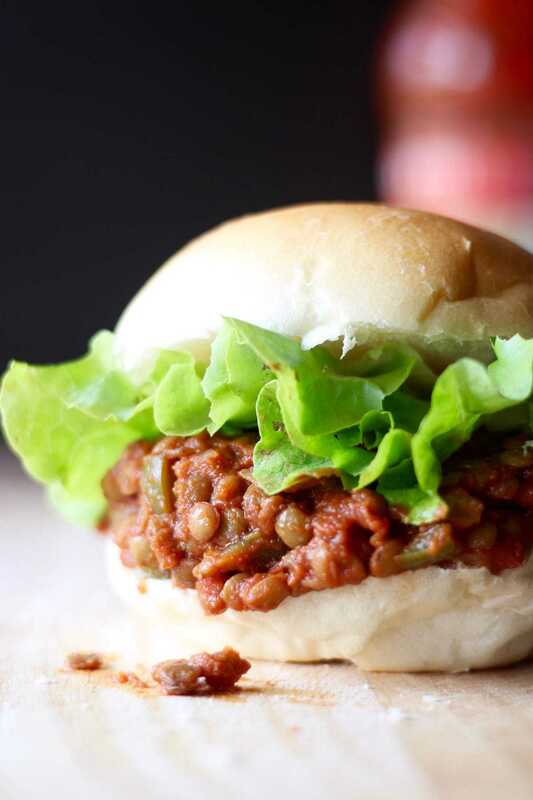 Tomato sauce, spices and some pantry staples like soy sauce and apple cider vinegar make up the sauce for these lentil sloppy joes. Then with some added texture and flavor coming from garlic, onion and green pepper, this recipe will be a winner with meat-eaters and vegans alike. 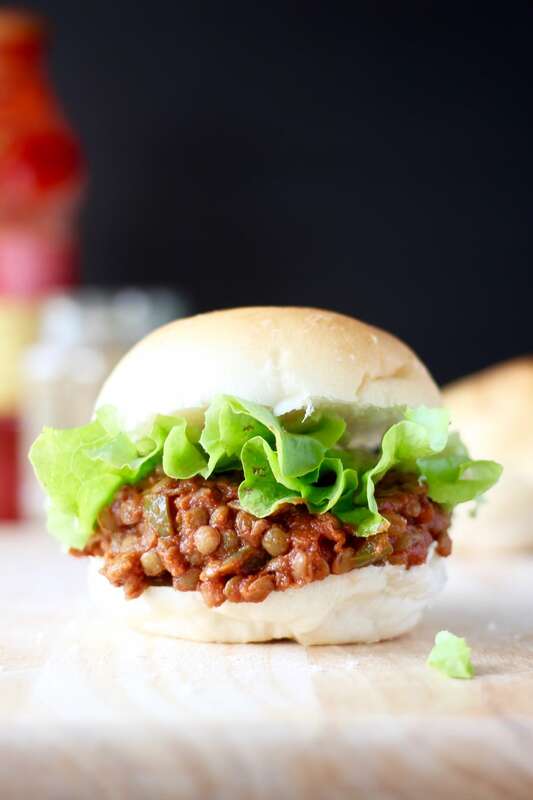 We love piling our lentil sloppy joes onto soft, doughy buns and topping them with something fresh and crispy like lettuce or coleslaw. You really can’t go wrong with this recipe and it makes for a great weeknight dinner. In fact, the sauce seems to get more rich and flavorful the longer it sits so be sure to double the recipe to ensure you have leftovers to make for easy lunches during the week! Please let me know if you give this simple recipe a try! I’d love to know your thoughts in the comments below. If you try out the recipe and like it, be sure to leave a star rating and share the recipes with others. And as always, take a photo and tag @theconscientiouseater on Instagram so I can see your creation! If you love sandwiches as much as I do, be sure to check out some of the other sandwich recipes below! 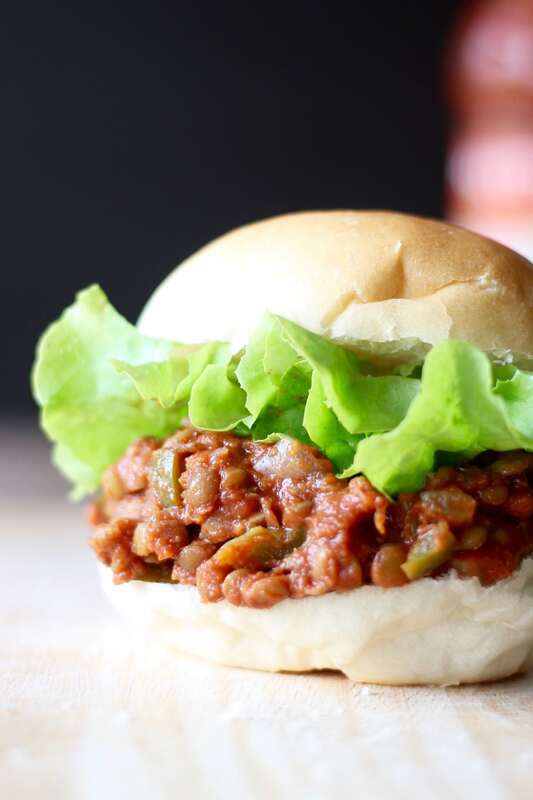 Made with warming spices, a rich tomato base and hearty green lentils, this Lentil Sloppy Joes recipe will quickly become a staple in your house! If using dried lentils, rinse 2 cups of dry green lentils and place them in a pot of boiling water to cook for about 15-20 minutes or until cooked through but not soggy. Once cooked, drain and rinse the lentils and set them aside. Meanwhile, in a large sauce pan, sauté the chopped onion and minced garlic until soft. Add in the green bell pepper and continue cooking for a few more minutes until the pepper softens. Add 4 cups of cooked lentils to the saucepan and stir well to coat all the lentils in sauce. If the sauce looks too soupy, you can add in more cooked lentils. Just remember that the sauce will thicken a little as it simmers and later when it cools. Allow the lentils to simmer in the sauce for a few minutes until everything is well combined and heated through. Taste and adjust seasonings as needed, adding more salt or soy sauce for saltiness, apple cider vinegar for tartness, or sweetener for sweetness. Serve the lentils on buns with vegan cheese, vegan mayo, coleslaw or whatever you desire! *If gluten-free, substitute tamari sauce for soy sauce! I forgot the stars! 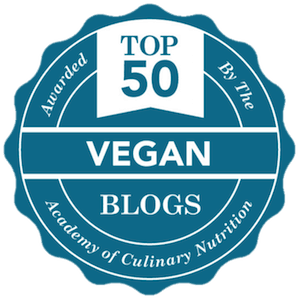 Definitely 5 star – I love lentils and I love having a great recipe for them! Ah thanks so much Meagan!! Just made them, now I literally can’t stop eating them!!! Delish! Thanks Faith! So glad you liked this recipe Meagan! Thanks so much for sharing. If you had time to leave a star rating, I’d so appreciate that!